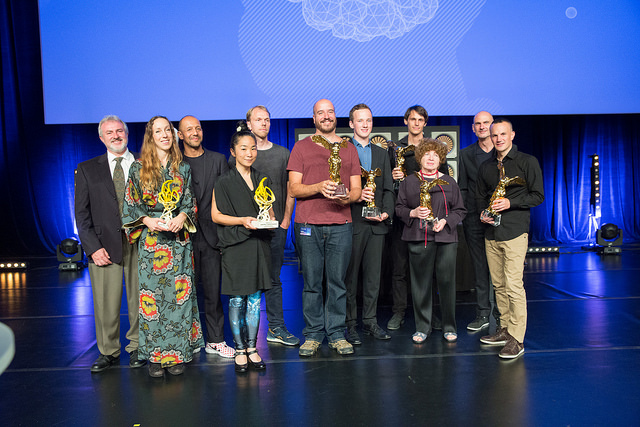 The P2P Foundation is very honoured to have received the Prix Ars Electronica Golden Nica 2016 for Digital Communities. We announced the good news a few months back and last week I traveled to Linz, Austria, to receive the award on behalf of the Foundation and present our work in a plenary. My partner, Ann Marie Utratel, who wrote the proposal and produced the video for the application, was originally slated to attend but finally was not able to make it, so I stepped in. It was both an intense week and tragic one, marked by the passing of our dear friend and collaborator, Jean Lievens, on Monday, September 5th. To celebrate Jean’s life, we decided to dedicate the award to his memory during the gala. We will feature a special post celebrating Jean’s life and work here very soon. I’d like to quickly mention two of the other prize winning projects: Refugee Phrasebook, a prime example of a solidarity-based knowledge commons, and Can you Hear Me? , who we covered in Commons Transition earlier this year as a great, cheeky and deadly serious way to highlight the surveillance increasingly pervading our networked society. We will soon feature the video of my presentation on Digital Communities and P2P. For now, we’d like to extend a big thank you to the larger P2P Foundation community and everyone who has contributed over the last ten years to achieve this milestone moment. It’s crucial for our movement to achieve this level of recognition and begin interacting with other movements, changemakers and, yes, “Radical Atoms” — to quote the festival theme — beyond the P2P/Commons community as we presently understand it. Lead image by Florian Voggeneder. Group image by Tom Mesic. See the full album from the Gala here.